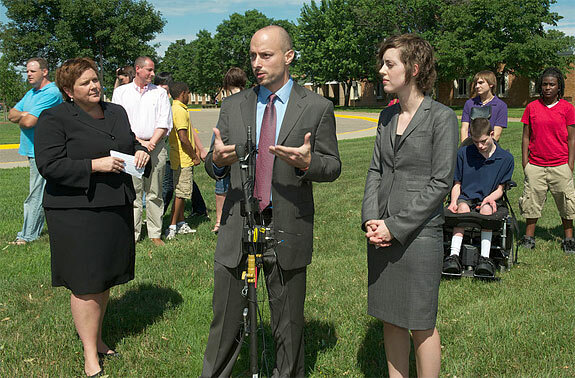 The Southern Poverty Law Center and the National Center for Lesbian Rights (NCLR) and Faegre & Benson, LLP today sued the Anoka-Hennepin School District in Minnesota, challenging the pervasive anti-gay harassment in the district’s schools as well as a “gag policy” that prevents teachers from discussing issues related to lesbian, gay, bisexual and transgender (LGBT) people. The lawsuit was filed on behalf of five students who have faced severe anti-LGBT bullying and harassment in school. It charges that the district’s gag policy perpetuates the abuses suffered by these students and others. The groups filed suit in the U.S. District Court for the District of Minnesota after the school district failed to address the persistent abuse or repeal its discriminatory policy. SPLC legal director Mary Bauer, SPLC's lead attorney on the case Sam Wolfe and Ilona Turner of the National Center for Lesbian Rights describe the case to reporters outside Jackson Middle School. The lawsuit comes a day after Anoka-Hennepin officials denied any responsibility for the severe and pervasive harassment suffered by LGBT students. It was also reported on Wednesday that the district is at the center of an investigation by the U.S. Department of Justice and the U.S. Department of Education’s Office of Civil Rights into reports of anti-gay bullying. A student was picked on relentlessly because he likes to wear colorful clothes and sing songs by female artists. His school’s response was not to address the harassment but to treat him as the problem. The school prevented him from wearing “girly” clothing and made him miss class time to walk through the hallways separately from the other students and escorted by a staff member. Two parents and a student spoke at a press conference today about their own experiences. “It got so bad that every day when my bus got to school I thought about hiding under one of the seats so I wouldn’t have to go in to school – so I wouldn’t be called names or pushed around and so I wouldn’t have to hear the rumors other kids were making up about me,” said one 14-year-old student. The school district’s gag policy, known officially as the “Sexual Orientation Curriculum Policy,” prohibits staffers from offering support to LGBT students or acknowledging the existence of LGBT people. It has played a significant role in encouraging the hostile climate by stigmatizing LGBT students – casting them as pariahs not fit to be mentioned within the school community, a message that comes across loud and clear both to LGBT students and their harassers. It has also limited the effective responses that teachers can provide when they see anti-LGBT harassment taking place. The lawsuit asserts that the district’s gag policy and its failure to protect these students violates their rights under the U.S. Constitution, Title IX and the Minnesota Human Rights Act. The SPLC and NCLR began investigating the district’s policies in 2010 after several LGBT students from the district died by suicide.